Turkey's foreign minister has withdrawn from a security conference in Munich after Israeli officials were invited. 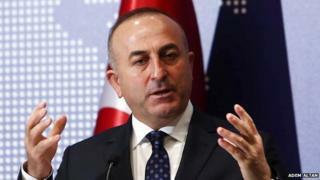 Mevlut Cavusoglu told reporters he had pulled out after an Israeli delegation was asked to attend a session on the Middle East at the last minute. He said his decision was not linked to Turkey's relationship with Germany. Ties between Israel and Turkey have been strained since a deadly 2010 Israeli raid on a Turkish ship trying to break Israel's blockade of Gaza. Nine Turkish pro-Palestinian activists were killed in clashes with Israeli commandos, who boarded the Mavi Marmara when the ship, which was leading a convoy carrying aid, refused to stop. Israel has maintained a naval blockade of Gaza since 2007, part of what it says are necessary security measures against the militant Islamist group Hamas in the Gaza Strip. Speaking at a news conference in Berlin, Mr Cavusoglu said a collective decision had been taken to withdraw from the joint session. "I was going to participate in the conference but we decided not to after they included the Israeli representatives in the Middle East session," he told reporters. Relations between the Israeli and Turkish governments have been particularly fraught since the deadly raid on 31 May 2010. Israeli soldiers boarded the Mavi Marmara, which was leading a flotilla containing five other vessels, in international waters, around 130km (80 miles) from Israel's coast. . Clashes ensued, leaving nine activists dead and 10 soldiers injured. The then Turkish Prime Minister Recep Tayyip Erdogan said Israel had committed a "bloody massacre" and withdrew his country's ambassador. In 2009, Mr Erdogan stormed off the stage during a debate with then Israeli President Shimon Peres at the World Economic Forum in Davos. Last year, Mr Erdogan, now the Turkish president, said relations between the two countries would not improve as long as Prime Minister Benjamin Netanyahu remained in power. While diplomatic ties between the two governments remain difficult, trade between Israel and Turkey has risen by almost 50% since 2009, and was worth more than $5.6bn (€4.9bn, £3.7bn) in 2014 according to official Turkish government figures. Last July, Ehud Cohen, head of foreign trade at the Israeli economy ministry, said that trade between the two countries was "growing steadily", and that his government "aims to increase exports to Turkey and encourage Turkish investment in Israel." Mavi Marmara: Why did Israel stop the Gaza flotilla?